Sally Keeney, Correspondent The Chapel Hill News Sunday, March 28, 2010 Stewart Walker and Pam Richey have just moved into the house of a lifetime. Surrounded by 17 acres of woods that Walker acquired over the past 30 years, this warm, contemporary home was inspired by the curve of the land and the track of the sun across it. Thirty years ago, Walker, a licensed massage therapist, and his friend, Gabriel Olmstead, were doing some clearing in the bottomland and Olmstead looked up and said that a plateau area about half way up the hillside would be a great place to build a tepee. "I've wanted to build a house on this plateau ever since," Walker said. Carrboro architect Jim Spencer (www.synergybuilding.com) has wanted to build a house on the same plateau since he and his wife had a picnic lunch on it two years ago. He was taken with the curve of the plateau along the wooded hillside, the stream below and the southern exposure of the site. Walker hired Spencer two years ago to design a house that would honor the land, have passive solar features, heart pine floors, a wood stove and, for his wife, a four-wind screened porch and water feature. "He listened to me, he listened to Pam and he listened to the land," Walker said. Now Stewart's favorite place is the balcony off the master bedroom overlooking that bottomland and the roof terrace facing the top of the hillside. His wife, a licensed family and marriage therapist, loves the screened porch and the kitchen with its wall of windows overlooking the back deck and woods. The kitchen's curved island opens to the great room of the house. And what a great room it is 1,200 square feet, two-stories with glass doors opening onto the deck and flooding the room with warm southern light in winter. Large overhangs shelter the house from heat as the sun moves north for the summer. 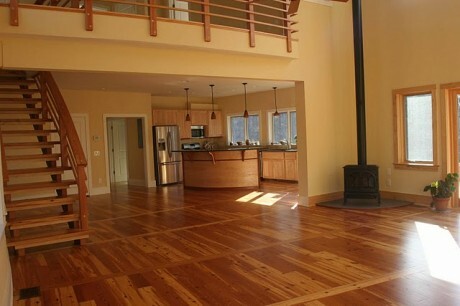 The look of the room is completed by wide-plank heart pine floors that mirror the 64-foot arc of the house. The floors were installed by E.J. Floors of Raleigh (www.ejfloors.com) and made from old mill beams salvaged by a company in Scotland Neck. "We are going to enjoy living here the rest of our lives," Richey said. Richey talks about watching the progress of the sun across the sky over her plateau like people at the beach talk about watching the sun rise and set over the ocean waves. Wright's influence As an architect, Spencer is always cognizant of the sun's arc. After the picnic, he thought of the solar hemicyclo that Frank Lloyd Wright designed for Herbert and Catherine Jacob in the 1940s. See a 1996 restoration of the Middleton, Wisconsin house at www.solarhemicyclo.org. Spencer's above-ground convex design is an inversion of Wright's Jacob II house which is concave and bermed. Wright's Jacob II was completed in 1948 at a cost of $20,000. Spencer's was completed last week at a cost of $180 per square foot, which also included extensive surveying, building a private road to the house site and installing the septic system, but not counting the cost of buying the land. Spencer designed the 3,600-square-foot Walker-Richey house with a 64-foot radius laid out to line up with the morning sunrise on the winter solstice at the southeastern point of the house. The heated and conditioned square footage is 2,650. 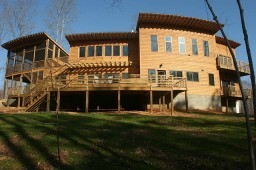 The house has another 950 square feet in decks, screened porch and carport. Spencer said that the 64-foot radius seemed to fit the lay of the land, the track of the sun and open as much of the south facade onto a view of the woods as possible. Spencer suggested to Walker and Richey that Tom Howlett of Synergy Building Company be the general contractor (www.synergybuilding.com). Both Wright's and Spencer's designs have C-shaped roofs, but Spencer's is an inverted C, and his above-ground design showcases the metal roof whose lines are slightly reminiscent of the Sydney Opera House thanks to large overhangs. The roof was installed by R.G. Roofing of Garner and had to be hand crimped at the edges because the kerf of the roof is not a standard thing, Spencer said. "Howlett and his subcontractors did things that were out of the ordinary," Spencer said. "There were a lot of difficult things to pull off, and there was such a good spirit with everyone who worked on it wanting to pull it off." Howlett concurs with Spencer's praise of the GAF roofing contractor; not only with the excellent craftsmanship, but also for coming in at a very reasonable price. The kitchen cabinets, which had to mirror the slight curve of the exterior wall, were built by Diane Swan of Diane Swan Galleries of Bynum Church Road, Pittsboro. She spent at least 20 extra hours designing and building those cabinets to fit the curve. The granite countertop also had to be scribed to the curve. The ripple effect The effect of having a curved wall is that it ripples all the way through the construction job, according to Howlett who said that his biggest question mark was laying out the curved house on a sloping site. To allay his worries, he had the surveyors, ENT Surveyors of Hillsborough, stake out the house every four feet before the concrete footers were poured. Then to assure his masons would be able to do a precise job, he had the surveyors come out again and mark the concrete every 2 feet. The surveying costs were higher than typical "at least twice the cost of what he would usually pay for surveying. The result," Howlett said, "was the masons did a great job, even with no perpendicular north and south walls. Right from the beginning from the footings and masons, everyone did a super job," Howlett said. The person that was the most impressive, according to Howlett, was the framer, Oscar Paz, because in order to frame it he had to scribe 2-by-10s to make the bottom and top plates for the 2-by-6 walls. The next bid for framing was twice the price that Oscar bid. The interior trim was done by http://www.elizabethgordonstudio.com/residential-interior-design/, who has been in this business for many years. Howlett describes Stroud a "wonderful person and fabulous trim carpenter. The stairs and railings could easily have cost $20,000 each. Stroud did the whole project for $4,000." He curved the handrail to the curved wall. He cut it out of a 2-by-10 piece of fur (scribed a curve on the 2-by-10) and ended up with 2-by-3 railing. Howlett said that it was "a challenge from the get go to stay within budget." His original estimate was significantly over what the couple wanted to spend. His firm cut it back to bare bones. They shopped the job extensively. Every raw material, finishes, labor, Howlett had to get a minimum of two bids to build the house within the budget. Walker and Richey knew they would have to go over the bare bones budget, but they committed to try to stay within it and spent many hours helping Howlett shop the job. "I figure we saved them $70,000 because both material and labor costs are down now due to the economy," Howlett said. "Whether homeowners are doing remodeling or new construction this is a good time." To build a comparable curved home, Howlett estimates costs about 30 percent more than a standard house. The Curved House is Complete! It’s done! It’s been a great experience all around. 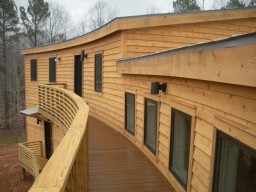 The curved features of the plan for this home required some thought and coordination not necessary in most projects. But, the extra time and attention to detail has paid off. The impact of the curves on the exterior is clearly apparent as you approach the home. It’s obvious why the curve was needed now, as you look at the finished house against the landscape. It fits in perfectly. The impact of the curve on the interior finishes is dramatic as well. The curved walls, handrails, cabinets, counters, and trim pull it all together. This was really a project that required a lot of “synergy”…and we’re all proud of the outcome! Click the image below to view a slideshow of the completed project.